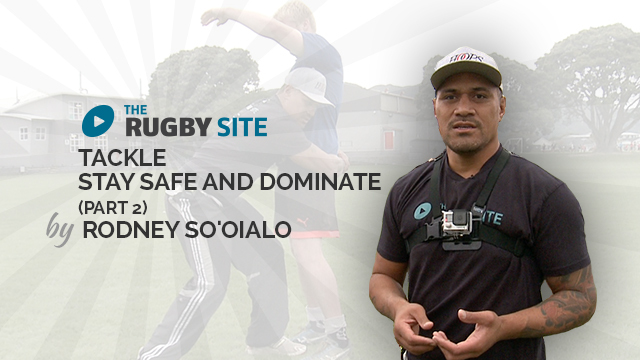 Watch Rodney, ex All Black and Hurricane, in his latest series - aimed at younger players. In the 1st video of this series, Rodney demonstrates how to tackle safely but still dominate. Enjoy! This is far away better than any training in tackling I’ve ever had. This was a great video on alignment. Simple and easy to understand. Thanks Rodney and your young players. The simplicity of drill can be used in each training to enhance muscle memory and correct technique while eliminating the hand grabbers, also great transitional drill into faster tracking and tackle technique. Great Video! Real essential breakdown of all the parts. The leg driving as demonstrated here, was enlightening with that second step. We were usually instructed to do more of the lunge, or go through type: this is better and I believe what we see in top-tier matches. Thanks mate. great series – really like the detail and way Rodney breaks the tackle down into the individual elements, without it being about the contact. This is all great stuff, thanks Rodney! A brief word document of the main points would be a great add on, Rugby Site! Nice demo uce. Thank you. Fundamental pointers we so often forget to focus on, as we are always looking at the bigger picture. Great refresher. The video is not playing for me, I get sound only. Very good break down of a core skill in rugby. Impressive in how he always explains the “why” which compliments the “how”. So many tackle techniques today poorly coached, leading to poor execution. This is an excellent session on how to perfect the little things make a big difference. Looking forward to more sessions from Rodney. Great drill roddy, something we all can put into practice. Very good drill to break down skills and build confidence. Second Juan’s point! I feel like this is a great progression towards Sir Grahm or Wayne Smith’s tackling sections. I love the small detail focus regarding hand positioning upwards. I had coached tracking with hands in, but I think that the footwork to shoulder targeting is a brilliant bit. I’m going to try this drill today. Looks a great basic drill. Good stuff !!! We can’t emphasize enough to stop using the arms when we want to tackle.